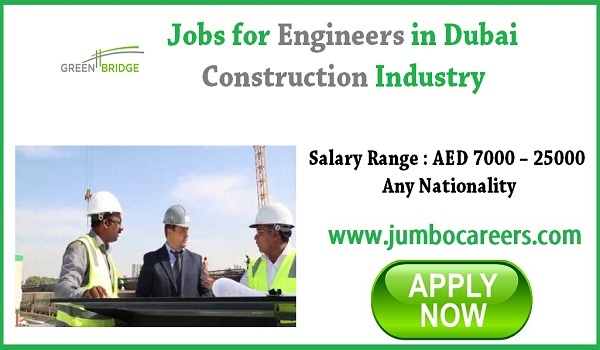 Global Green Bridge Contracting LLC Dubai hiring experienced engineers urgently. Only experienced candidates considered for all positions. About the Company : Green Bridge is a leading construction company offering green building solutions and other manufacturing solutions of exemplary standards. The company has a G + unlimited license, adequate infrastructure & machineries and also employs 1800+ professionals, including 125 engineers, who can deliver design and build contracting jobs of complex nature with the highest standards of precision and value engineering. - Project Manager – 15-25 years UAE experience with BE Civil. - Construction Manager 15-20 years UAE experience with BE Civil. - Planning Engineer/Project Coordinator 3-6 years UAE experience with BE Civil. - Project Engineer 6-8 years UAE experience with BE Civil. - Site Engineer same as above. - QA/QC Engineer 5-6 years UAE experience with BE Civil. - MEP Coordinator 6-10 years UAE experience with Mechanical/Electrical Engineer.